1. Cook basmati rice in open vessel with little salt & khada masala (cinnamon, cloves, bayleaf) in water. Drain and rinse with cold water when it is 80-85% done. 2. Drain excess water from parboiled veggies. Add tomato, curd with all spices and mix well. 3. Heat oil in kadai and add cumin seeds, hing. 4. When it starts spluttering, add onions (cut in strings - julien) and fry it till dark brown. 5. Take fried-onions out and add veggies mixture in the same kadai. Mix well and cook it for around 5 mins. 6. Make alternate layers of veggies mixture & cooked rice in kadai/oven-bowl. 7. 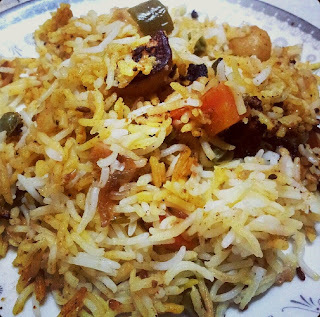 On every layer of rice, sprinkle fried onions, a pinch of garam masala, few chopped mint leaves & pour 2 tsp saffron milk. 8. Repeat the process for making alternate layers (minimum 2 layers each). 9. If it is to be cooked on gas, cover the kadai with a lid and seal the sides of it with normal chapati-dough*. Cook for around 15 mins*. 10. If you are using oven, seal it wit aluminium foil & bake it for around 20-25 mins on 160 degrees. * Alternatively, you can use a big kitchen towel. 4-fold it and arrange it on kadai. Cover it with a lid tightly and place a heavy weight on it. * If you are using a iron-kadai (not the non-stick one), after 5 mins, place a flat tava on gas and put kadai onto it. OMG... thanks for sharing this recipe shruti..it turned out really well..